We had planned ahead of time to take an extra week and travel to Maine to visit Marcia's Aunt Martha in Farmington, ME and our nephew, Matt, in Rockland. I woke at 12:30 and 2:35 and got up at 3:30 in the afternoon. I think I caught up on my sleep. By 4:00 Marcia and I drove to Target and I bought some (3 pairs) of earbud earphones which have a control button on them for pausing and changing the volume while running. Then I went crazy and got an AM/FM arm radio, a speaker, a Palm charger and car charger, a Bluetooth device, a 16G vault chip, two phone wallets and a current converter. I tend to do this only when I am travelling and don't really know why. We drove back to Melrose and at 7:00 I had a cappuccino at their downtown Starbucks as I have on previous trips. Their coffee is really good here unlike most Starbucks. They have free WiFi here and a comfortable place to use it. Thus I can do my email, download Rush and do the LA Times crossword puzzle. I was already in my running gear so at 7:50, I did my run through downtown starting from St. Mary's Church. After getting back to the house, at 9:00, Charlie drove the four of us to dinner at Legal Seafood [210 Andover Street, Peabody, MA, 978-532-4500.] We all shared a bottle Cave Saumur Sauvignon cabernet franc '07. We visited the city of Saumur in the Loire Valley during our 2005 France trip. We got to see Odile again who served us the last time (see 2009 Trip.) To order live lobsters from Legal just click HERE. We had a lovely and filling dinner as we always do at Legal and got back to the house and at 11:00, Charlie wanted me to try some Samuel Adams special brew which I enjoyed and then went to bed. I woke at 5:30, 9:45, and got up at 9:50, a little earlier than usual. I went to CVS pharmacy at 11:50 and bought some batteries and more earphones then at 12:00 noon got a cappuccino at Starbucks. The earphones did not have a control button so at 2:00 I took them back. At 2:10 I drove back to Target to return a wallet and another set of earphones and then bought a new set. I got back to the house and we packed up for our trip to the north. 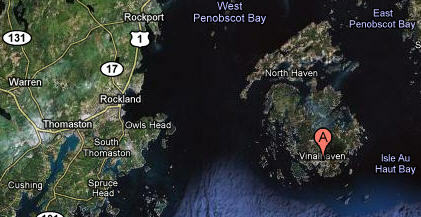 At 2:20 I drove to Yarmouth, Maine. 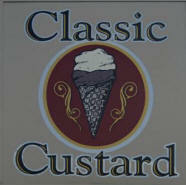 At 3:55 we had a pitstop and then at 4:00, Marcia drove to Freeport but at 4:10 we stopped at a place called Classic Custard [150 Route 1, Freeport] that sells frozen custard. This is not frozen yogurt; its CUSTARD. You only find it in the East and the Mid-West. The best in New York was Carvel and the last time I had one was in a tiny village outside Cleveland, OH many years ago when I was invited to lecture there. 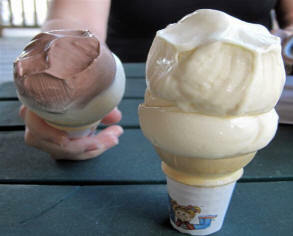 It was so good I had 4 different cones, each a different flavor. I have never found any in California. It was pretty good but not as good as I remembered and I couldn't eat it all. We headed out and at 4:30 we got into downtown Freeport and our destination, L.L. Bean. Its easy to find it. We went in and looked around inside but didn't buy anything. ...with some pretty nice rainbow trout swimming around. Kids love it. We headed out and at 5:15 we stopped at a stand called Linda Bean's selling only lobster rolls and we each got one for $16 a piece. They made them a little too dry for my taste and I told them so. After enjoying our first lobster rolls in quite awhile, we left at 5:30 and Marcia finished the remaining drive to Rockland, her home town. On the way we passed Red's Eats in Wiscasset, ME [41 Water St., 207-882-6128] that has very good lobster rolls (they are famous for them) but we were too full. We should have waited. That's our rental car in front. I got unpacked and changed and at 7:40 did my usual run to the gazebo near the marina; its a very nice view at sunset with a cruise ship in the harbor. I ran back to the hotel and at 8:30 we drove back down there to dinner at the Boat House [58 Ocean Street, 207-596-0600] (below) which is near the gazebo. Our nephews Wesley (last on right) from Florida, Rowland (next to Wes,) and Matt (left of Marcia) joined us along with two of Rowland's friends from Ft. Collins, CO, one who we have met before. They have a nice outside bar (below left) which is opposite the inside bar (below right.) The boys and I enjoyed a Guinness at the inside bar before being taken to our table (above) outside on the other patio. For an appetizer I had fried haddock sandwich without the bread with french fries. It was fantastic, especially since I can't get haddock at home. Then for an entree I had a two 1¼ lb lobsters (one at a time) with steamed broccoli. Marcia had white wine with a salad and then sautéed lobster with french fries. We got back relatively early and I went to sleep watching a movie on the Archos unit. I awoke startled at 2:45 AM and in doing so my earphone cord yanked the Archos movie player off the nightstand, smashing it to the floor. How stupid; I hadn't secured it more safely. I went back to sleep and woke at 1:20 PM and checked the Archos and it came on asking if I wanted to reformat the drive. I clicked NO and it just shut down. Three more tries with the same result led me to try saying YES: same result. The unit was cooked and I figured all 73 full-length movies on it were gone. This is after waiting six months for Archos to repair my original unit which glitched out on its own at the end of our 2009 trip. They finally sent me this refurbished unit. Here are two views of the Inn and a shot of our room. The bathroom (below right) was done nicely with long curtains but you need to make sure they are pulled closed when in the shower. Since we were the only ones left in the Inn, I went from room to room to see what the other ones were like. They were all very nice. Going downstairs (below left,) you come across the very nice sitting room (below right) but we never used it. Then there is their breakfast room and they have a large living room in the front. 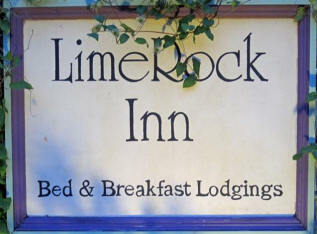 As you leave the Inn by the front door you cross their very inviting front porch with comfortable seating (below.) You don't see this much in the West. Feeling kind of down, I got up at 2:30 and took the car to the Radio Shack at 3:15 and bought two more sets of earphones and a laptop locking cable. At 3:45 I went to the Walmart (below) and bought a volt converter, two pillows, a passport cover and a 32G chip for the computer. ...then again on its right side. At 5:30 I called Verizon (Lloyd) and cancelled the Palm Pre telephone service since I had given up on being able to synch my calendar on the phone using Google. Then I successfully called the company I bought the Palm Pre from to get an RMA number so I could send it back. I got back to our Inn and at 7:50, I started my usual run to the Boathouse. On the way down from the street to the marina area you pass the Time Out Pub (above) [275 Main St., 207-593-9336] which I have run past many times but never had time for a "time out." Its a nightclub at night with live music. You have to run along the side of the building and down a steep incline to get to the entrance in the back and the landing area. As you get to the flat of the landing, they still have the tents set up from the annual Lobster Festival (above.) Check the link for future dates. I guess another event is planned for the tents. Going along the boardwalk, the marina (below) with the Boathouse off on the right, makes a nice view as you run. 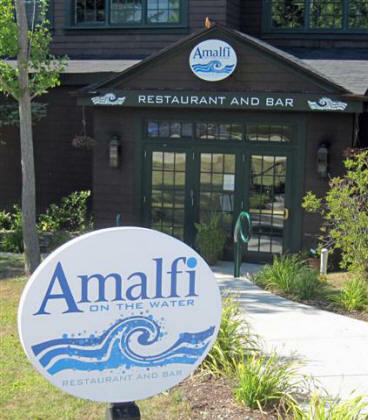 I then ran in to take a look at the new location of the Amalfi Restaurant [421 Main St., 207-596-0012] which had moved from Main St. since I was here last. The Amalfi was the last time I was able to coax Marcia's mother to go out to a restaurant for dinner. This part of the building used to be the lunch area for MBNA credit card company that built this whole oceanside complex, had their headquarters here and then picked up and left. The restaurant is quite spacious (below left) and the bar looks nice (below right.) The Italian food was always good before so we should try it some time. I got back to downtown and took a few photos. 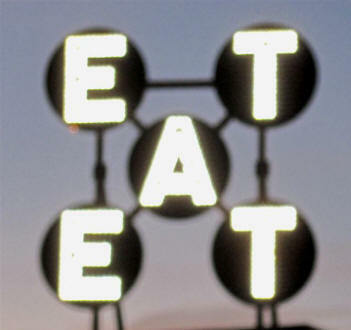 This EAT sign above the Farnsworth Museum (below) is new. I discovered it had nothing to do with eating or a restaurant. It was a piece of art by Robert Indiana that he was commissioned to make for the New York State pavilion at the 1964 World's Fair in NYC. It was inspired by his mother's last dying words, " Do you have something to eat?" He was the star of Andy Warhol's film Eat (1964), which is a 45-minute film of Indiana eating a mushroom in his SoHo loft. He is famous for his sculpture LOVE in NYC (above left; postage stamp above right) and recreated it in 2008 as HOPE (left) and donated all the proceeds from it (>$1 million) to the Obama campaign. Pretty creative, huh? He certainly must be very proud of that now. After the EAT sign was installed, long lines formed at the entrance of the NY Pavilion expecting to eat. Since there was no food served in the pavilion, it created so much confusion they turned the lights out and then ultimately removed it. The artist carefully stored it in NYC then later moved it to Vinalhaven (right,) a large island off Rockland's shore, where he relocated in 1978 (I have never been there.) The Museum restored it and installed it on the building. Above is a shot of Main St. looking north. At 8:20, I ordered a lobster roll "to go" at the Rockland Cafe [441 Main St., 207-596-7556,] (above right and below) something I do quite often. They really have the best in my opinion. While waiting for them to make it, I took some photos of the store windows on Main St. many of them displaying old antiques, especially old sailing boat models. Again, the classic question: better with a flash or without. From left; little Chaz (Charles Wasgatt,) his dad Wesley and Aunt Marcia. Now here is the cute part. I got my bill and paid it with a credit card but then wondered why the sales tax was such a neat round number. After questioning the waitress she told me it was the owner's policy to round the tax UP to the nearest quarter, but never round it DOWN. Have you ever heard of anything like this before? I haven't. A neat way to illegally boost the profits over a year of sales. Thus he would round up a bill of $100.01 to $100.25 thus adding from a penny to 24 cents to your bill. Very few people would pick up on this and if they did, how many would bother complaining. When I complained, she brought me the correct change of $0.17 (left.) I later checked with the Maine Franchise Tax Board by email and they confirmed that what he is doing is definitely illegal. So, enjoy their good food and view but watch the check carefully. We said good-bye to Wes and Chaz and then drove back to Rockland and at 11:30 Marcia and I had a nightcap of red wine, again at the Black Bull Tavern. We got back to the hotel and got to bed early and, of course, no Archos movie tonight. I woke at 6:30 and then at 9:00 AM by Marcia. I got up at 9:15 and packed my bags. I had decided I would send the Archos back home and I HAD to get the Palm Pre back to the company by tomorrow's deadline or I would be charged a bundle including a two year contract. 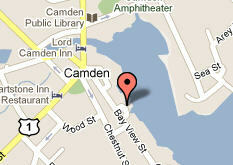 So at 10:10, I drove to Camden where the only shipping place was located in the area. I arrived at Global Pack & Ship [25 Washington, 207-236-2926] at 10:30 and had them ship by FedEx the Archos unit and the Palm Pre which cost a whopping $76.85 because the Palm Pre had to be over-nighted to meet the return deadline. Since I was already in Camden, at 11:00 I went to my favorite coffee shop here called Boynton-McKay Food Co. [30 Main St., 207-236-2465] (below, and below left) and had a cappuccino made by a very nice barista. In the spring of 2010 Food Network Magazine took a cross-country road-trip in search of the ultimate breakfast. 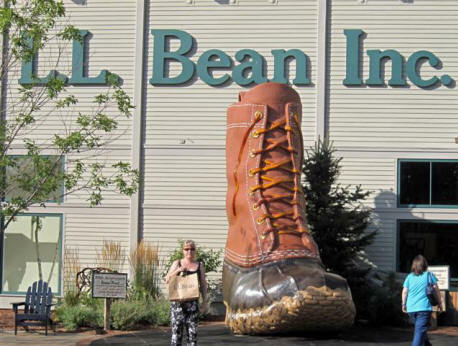 They named them the best breakfast in Maine. Too bad I don't eat breakfast. After doing the LA Times crossword puzzle and my email, at 1:15, I returned to Rockland and the Radio Shack and bought a car plug-in charger and then went to Rock City at 2:30 for another cappuccino. I did a cataract journal (JCRS) article review and sent it off. I then went back to the Inn, changed and went for my run to the gazebo at 4:05. When done I ordered a to-go order of fried haddock with french fries at the Boat House. Their waitresses are very nice. Below is my last PhotoStitch panorama of Rockland Harbor with the Boathouse way off on the right. I walked back into town and got another cappuccino at Rock City (above) and then Marcia joined me (sitting in window, above.) 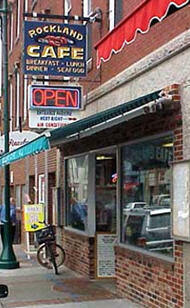 I then left and got another lobster roll to-go at Rockland Cafe (below left.) 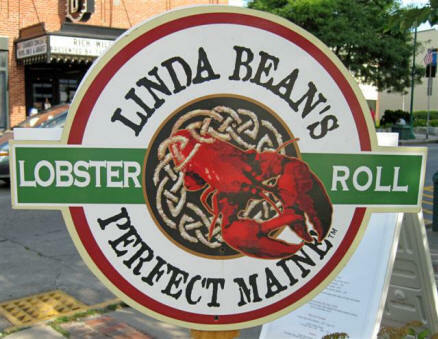 I also saw that Linda Bean opened a lobster roll shack in Rockland near the Farnsworth Museum. I walked around a little and stopped into In Good Company [415 Main St., 207-593-9110] (above right) to finally say hello to Melody (below right,) the owner. I told her we were very disappointed that we were never able to stop for dinner or a glass of wine. She runs this wonderful place and am glad to see it is still doing well in this lousy economy. 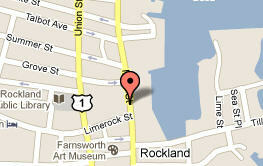 I later found the little cafe called the Brass Compass [305 Main St., 207-596-5960.] We've never eaten there but they are supposed to have the very best lobster club sandwich which became famous when Lynne Archer (chef) beat Bobby Flay in a "Throwdown" contest on the Food Network. But, when I went in to get an order they said they were all done for the day. What a shame! We're leaving today. We got there at 5:45 and as you can see, it is really "out in the woods." I went around and took a lot of pictures of the place. Thats the main entrance above the steps. Below is a view from the dock. The lake is usually calm. After you enter, there is a small little kitchen. From there you enter the main room of the cottage. This is looking away from the lake. This is the same room looking towards the lake. Through that door above is the veranda where there are several cots to sleep on. It is screened in and we used to play cards there. Inside off the fireplace are two bedrooms; the master on the left (below) and the other on the right where we would sleep when visiting Marcia's parents. Marcia struck up a conversation with the neighbor, Barbara Hansen. She and Stan live in this beautifully done normal modern house next door. When I finished, I sat out by the lake and enjoyed my rare lunch of the fried haddock from the Boathouse (earlier) and the lobster roll (below.) It was great. We said good-bye to Barbara and at 6:55 Marcia drove the 76 miles northwest to ward Farmington, Maine while I did an AJO journal review and sent it off as we went through Maine's capitol of Augusta. We arrived in Farmington at 8:40 and decided we better eat first before going to the hotel we had booked which a little out of town. We ended up trying a place called Boivin's Harvest House [367 Wilton Rd, Farmington, 207-778-6880] and had dinner at 8:45. I had a Heineken then liver with onions, corn and sweet potato fries followed by a strawberry shortcake. None of it was all that great. I should have ordered what Marcia did. Marcia had a white wine and a cheeseburger which was OK. 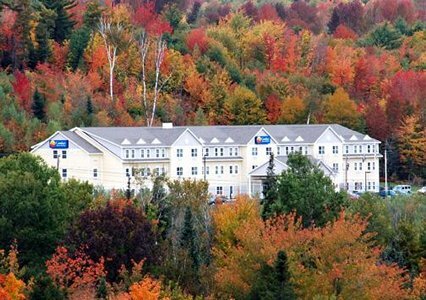 When we finished we had to drive a little out of town to check into the Comfort Inn [1026 US Rte 2 E, Wilton, ME, 207-645-5155] (above right) at 10:00. The room (below) wasn't bad for the price and they had free WiFi. We went to bed around midnight. I woke at 4:45, 9:15 and then was woken by the hotel at 12:00. I got up at 12:40, we packed up and at 1:05, checked out of the hotel. Its a pretty big place. Here is our white Chevrolet Hertz rental. We got there at 2:30 and went inside and upstairs to her room and had a wonderful visit with Martha. She taught for many years at the University of Maine here in Farmington and is now 101 years old and as sharp as a tack. There is no sign of senility and she really loves to talk. She always loved her flower gardening and pressing flowers for cards and art. Here are some of the ones she donated to the home. At 4:40, Marcia drove 97 miles south heading back to Melrose and at 5:40, we got lost while trying to get through the city of Auburn. After getting out and asking for help from a nice lady at the Rite-Aid, we were back on track. At 6:50, we took a pitstop in Kennebunk, Maine and got a peanut butter and jelly sandwich and pretzels. This was quite an elaborate freeway rest stop; the inside had many food courts. Back on the road at 7:00, I drove the remaining 75 miles to Melrose. After paying a $2 Maine toll then you have to pay a $2 New Hampshire toll to cross this little strip of the state that goes to the ocean. We arrived in Melrose at 8:05 and since Charlie and Cathy were at their place on Cape Cod, I decided it would be wiser to go directly to downtown for a run and dinner before going to the house. I went in Starbucks and changed my clothes and at 8:20 did my run through the streets. At 8:50 I stopped in CVS pharmacy and bought some Melatonin for the flight. Then I shopped for wine at this new store called Beacon Hill Wine [538 Main St., 781-665-3332] run by the Bernaldis and noted the sign saying "Today is no sales tax day." So I found my favorite Italian white wines, Orvietto Classico and Vernaccia di San Gimignano and bought a bottle of each at a reasonable price with no sales tax. I went back to Starbucks and changed and we decided to try a new place (for us) called Stearns & Hill's Bistro [505 Maine St., 781-662-9111] and went for dinner at 9:00 PM. There were no seats at the bar so we took a little side table. We later moved to the bar for dinner. We both enjoyed a bottle of Gabbiano Pinot Grigio and a dozen steamed clams which were very good. It was all very good and we had a good time. We learned they have a very strange drinking law here in Melrose. They used to have Blue Laws here. At a bar you can only be served a maximum of one drink unless you order something to eat. So, if you just want to drink all evening, you have to go from one restaurant bar to another. After dinner we walked around awhile, then went back to the house, unloaded the car and went to bed around midnight. I woke at 5:00, 6:30, 8:30 and finally got up at 11:10 so I could drive down to St. Mary's Church (below left) for 11:30 Mass. This time they used the main church for the service instead of the chapel down in the basement. I had forgotten to bring my missal from St. Monica's so I could understand the readings when in Europe. I had asked Claire a week ago to send it to Melrose but it never arrived (It was there when I arrived back from the EU.) I was thinking of snitching one from the church here but decided that was not a good idea. I brought one out with me and discussed my need with the priest (above right) and he told me to just take it with me. It pays to be honest. Then I drove to Starbucks for two cappuccinos while doing email and the puzzle. 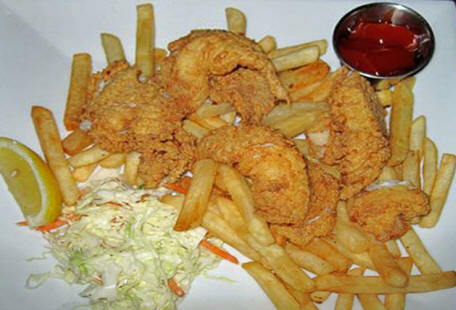 I was there until 6:45 when I went to Turner's Seafood Grill [506 Main St., 781-662-0700] and ordered a piece of haddock for tonight because Cathy had gotten salmon for dinner (which I don't care for, unfortunately.) 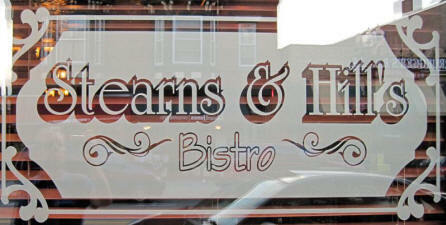 At 7:20 I did my run in the streets and when I was finished I stopped and had a Guinness at Stearns & Hill's. Charlie was kind enough to drive down and pick me up. At 8:15, we had dinner at the house of haddock, cold shrimp, corn on the cob and Caprese salad along with the bottle of Le Rote 2007 Vernaccia di San Gimignano I got at the Wine House. Everyone else had salmon. At 10:00, I got a call that Tania and Anastasia had arrived safely at LAX and were heading to our house. I finally got to bed at 12:45 AM. I woke at 5:20, 7:20, 10:40, and then at 3:20 PM with an amazing dream. 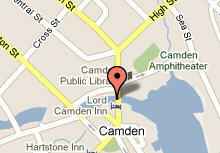 At 3:55, I got up and by 4:20, Marcia was driving us to the Peabody Mall in Peabody. We stopped in Macy's and bought a neck pillow for sleeping on the plane. It wasn't exactly like the one I couldn't find at home so we kept shopping. At Sears I found what I was looking for and bought two of them and then went back and returned the one from Macy's. At 5:10 she drove us back to Melrose and at 6:00 I got a cappuccino at Starbucks. I stopped in at CVS again and got some envelopes, a Tide stick for clothing stains and some glue. At 8:00 I ran the streets and at 8:30 got back to the house and had some Heinekens with Charlie and his son Wes who had driven down from Maine as well. I had been telling Charlie how great the restaurant Absolutely Fabulous [454 Main St., 781) 620-0940] was but he had been there once after they first opened last year and didn't care for it. The owner had given me a coupon to give them to come back but they never got around to using it. So I invited them to dinner there and we could use the coupon. We got there at 9:30 and I ordered a bottle of Italian Ruffino Chianti, which we always enjoy at La Vecchia in Santa Monica. We had a chance to say hello to Lena (on the left) and Lori. It was good to see them again. Marcia had the pasta special which was fettuccini carbonara with prosciutto and peas (below.) It was fantastic. I ordered what I had last time we ate here; fettuccini Alfredo (below left) for a starter followed by chipotle pork ribs with sweet potato fries and steamed broccoli (below right.) They were not small plates and both were exceptionally good. I would highly recommend eating here. I've certainly eaten a lot of great sweet potato fries and broccoli on this trip. They were both exceptionally good. I would highly recommend eating here. I've certainly eaten a lot of great sweet potato fries and broccoli on this trip. We got back to the house at 11:00 and I had some beers with Wes & Charlie and got to bed at 2 AM.